On Sunday 29th September I lined up on the start line for the Brigg Sprint Triathlon. The course was flat and suited my inability to climb on the bike. I was slightly apprehensive before the event. 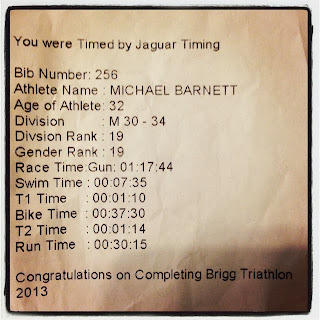 Because of my estimated swim time of 06:20 I was placed later on in the field with the really quick triathletes. Great, as soon as the swim was over I would be left for dead. I was due to start at 10:02 and the final wave was scheduled for 10:04. I knew in my heart that I would be the last finisher after being overtaken on the bike or run by the potential 9 other athletes who would leave the pool after me. On race day I arrived at the Ancholme Sports Centre at 07:25 to register for the event with my Dad who had come along to spectate. The goodie bag was immense for the £42 entry fee. You got a Tshirt, bike bottle, flapjack, Haribo and bananas. After registration I made my way down to transition which was on an all weather pitch to rack my bike. In transition I bumped into my coach from GI Tri. He was one of the aforementioned quick triathletes who would be starting the race before me. Since raising my saddle by 40mm I have found that racking my bike is more difficult because of the low A-frames and this again proved to be the case at Brigg. After racking my bike and laying out my towel and bike shoes I went to chill out in the car as I wasn’t racing for another 2 hours. I read 220 Triathlon to kill the time. Before my wave was scheduled to be poolside I re-entered transition to drop off my trainers (I had forgotten to bring a second pair). Everything was still as it should be in transition. I had decided to complete this event sockless. Given the trouble I have had with blisters this was a real gamble. Not one that would result in a DNF but one that could result in pain. It was only when I removed my trainers that I noticed the all weather pitch was covered in sand. This had me stressing out because as we all know I have sensitive feet and the sand may exacerbate any potential blisters. I would just have to be careful. After taking off my joggers and hoodie I made my way poolside. We were then given our timing chips and it really hit me hard at this point how out of my depth I was. Here I was surrounded by all these lithe athletes weighing a maximum of 12 stones in their GB trisuits and I felt like a fraud. Yes I can swim and bike a bit but this was ridiculous. The aim was now not to embarrass myself. We entered the pool where there were already people swimming and waited for the 3, 2, 1 GO! We were off and I was doing my best not to embarrass myself. 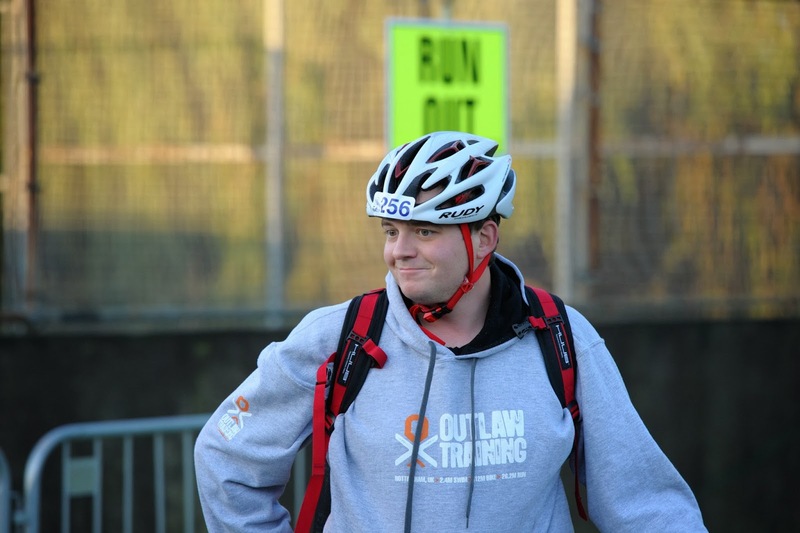 In the wave before me was Dean Kirkham (@triathlondeano) who finished 9th at Outlaw and he was a good target for me to aim for. He was at the end of his fifth length when we started swimming, which meant he was at the other end of the pool. My target was to get as close to him as I could before he finished. I had 11 lengths to try and reel him in and claw back the length deficit. I ignored the other swimmers in my wave and concentrated on Dean. I am glad I chose to do this as the other swimmers in my wave were rapid. By the end of the 10th length I reckon I had pulled back the 25m lead to around 4m which when you consider the calibre of athlete that Dean is, is a massive achievement. Dean left the pool then and I was back to concentrating on the other swimmers in my wave. They were all significantly ahead of me. Ignore the demons. I will freely admit to being a little disheartened at being last out of the pool. This was the first time this has happened. 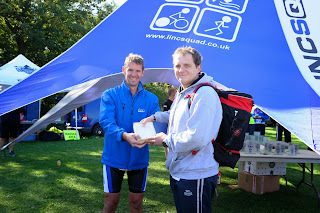 In my last pool triathlon I exited the pool first and had lapped the swimmer behind me. I had also been fifth out the water at Leeds Triathlon and first out the water at my last aquathlon so this was a shock to the system. I left the pool after 6:25 which is a respectable time and I posted the 28th quickest swim time of the day out of a possible 231 athletes. 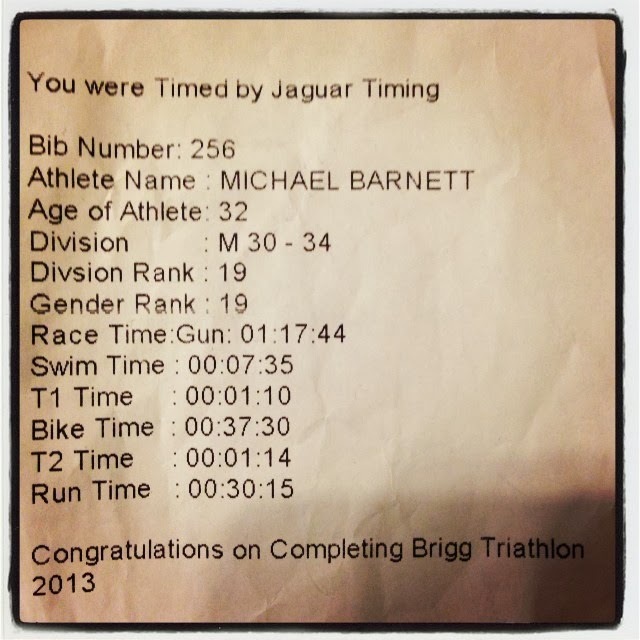 My official swim time was 7:36 but this includes the walk / run into transition. In T1 I briefly saw someone from my wave as they were leaving transition so I wasn’t that far behind. I dried my feet as best as I could to remove as much sand as possible before putting on my bike shoes. I then put on my number belt, sunglasses and helmet before removing my bike exiting T1 1:11 after entering it. Lauren York the GB age grouper overtook me as I was leaving T1. I have ridden the course before on a reconnaissance before the Lincsquad TT so knew what to expect. I knew the time we did the ride in as a group so my main aim was to beat it. As a group myself and two colleagues had ridden the course in 38:10 so this was my aim. 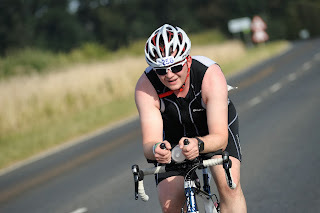 I had also ridden the TT route in 27:17. I knew the course was mostly flat with the occasional incline and that I could work hard as there were no real climbs. With this in mind I set off pedalling. The plan was to keep my HR around 160. I think I managed this but as my watch was on my wrist I have no idea if this was the case. According to the data this looks to be the case. After about 4km the last of the three competitors who started behind me had passed me. I tried to put the hammer down but there was no way I was catching these people. I saw my coach on the return leg on his bike and he was chasing down Dean. About ninety seconds before I reached the turn point I noticed another rider who I had not seen before and painted a target on her back. I like to have something to try and chase down as it brings out my competitive side. Just after this I noticed Lauren York again so she had put about a minute into me on the outward leg. At the turn point I joked to the marshals that they could go home for Sunday roast as I was last. As I turned the roundabout the wind hit me, I had been expecting it as I had felt a sidewind on the way out but still the force of it surprised me. This was going to be a long trip back. My first 10km was completed in 18:38. I was pleased with this. I now had a five mile slog until the next turn point. Time to crack on. As we turned into Brigg the sidewind became a headwind and this hurt. I didn’t lose faith but did lose about 6mph. Just before the second turn point I saw the rider who I had targeted before. I hadn’t managed to catch her but I had pulled back the 3 minute lead to less than one. I turned the final roundabout and made my way back to the Sports Centre. I took my feet out of the bike shoes before the dismount line and ran with my bike into transition completing the bike leg in 37:30 and finishing 102nd out of 231 athletes. Top 50%. I really am making progress. I racked my bike with a little help from the official as the racks were bedlam, removed my helmet, wiped the sand off my feet and slipped on my Skechers Go Run 2 trainers complete with Xtenex laces and was frantically looking for something. What a disaster my stuff was strewn everywhere in T2. I could not find my Huub visor anywhere. I like to race in a visor as it helps block out my surroundings. After about 20 seconds I found my visor picked up my free plastic Iconiq container of water for the run as I hadn’t hydrated very well on the bike leg and set off. I much prefer running off the bike to running normally and find I can maintain a more consistent pace off the bike. After about 100m I tripped up did a ninja roll and managed to squash the container of water and splash it all over myself. There were a few gasps from spectators until they realised I was fine as I was back running. I imagine it looked like one fluid movement but it was more likely that I resembled Dumbo on ice. The run route took you round the sports centre and up a short but steep hill before you joined the pavements and then consisted of an out and back for 1.5 miles each way . I knew I was last and I was fine with this. I just needed to do my best on the run. After about half a mile I saw my coach from GI Tri who was again just behind Dean and he mumbled something at me. I am sure it was encouragement but it was unintelligible as he was in another place. I passed through Brigg and was really enjoying the crowds and marshals who were very encouraging. I glanced down at my watch after it beeped marking one mile and was pleased with the pace. The time said 08:45 for the first mile. I normally overcook the first mile but this pace was pleasing. I am sure this was because I had no one to race. With about 400m to go until the turn I saw two competitors and noted that one was limping. The other was the competitor from earlier on in the bike who I had targeted. I tried to cheer up the limper but he looked in a lot of pain. I reached the turn point and told the marshals to go home as their job was done. By this point I was joined by a bike marshal who was riding with the last placed person. After a bit of banter he commented on how relaxed I looked on the run. I was feeling anything but relaxed. I was maintaining a pace quicker than usual after thrashing myself on the swim and bike and was starting to struggle because of poor hydration but my run was its usual “pretty” self. How my run can be described as looking relaxed or pretty baffles me. It really does. I powered through my second mile in 08:46. How is that for consistency? After a distance of 2.22 miles I caught up with the limping competitor. The lad was about 20 and looked to be in severe pain. I stopped to talk to him. He said he didn’t think he could finish. Now I know I have a bit of a history when it comes to helping competitors having helped people at London in 2012 and Outlaw in 2013 but how could I not attempt to help someone else. I started a conversation and he said his pain was at about 80% and he couldn’t bend his knee properly. I said I would run with him if he wanted. I really dropped the pace and together we slowly made progress to the finishing line. I knew that with each passing step we were closer to the finish. I tried to keep the banter level high so he would ignore the pain. As we made our way through the town centre I made sure I thanked each and every marshal. My limping friend stuck on my shoulder and we made our way back to the sports centre. I asked him if he had a sprint finish in him and he said he thought so. About 15m away from the line he sprinted away and dropped me when I wasn’t paying attention. I was a little annoyed with this as I had sacrificed my own PB aims to help him back and he dropped me on the line as he “didn’t want to finish last”. I could have been like everyone else and run past him and I do doubt whether he would have finished as he was not in a good place when I caught him but I haven’t been raised to do things like that. My final run time was 30:25, which I believe was 3:30 longer than it needed to be as I was consistently running at 08:45 pace. 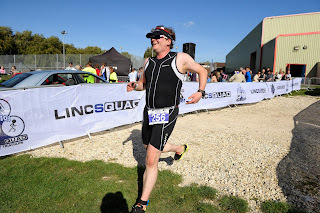 In total my finish time was 1:17:54 and this put my 125th but if I hadn’t sacrificed my time it would have been 1:14:24 and I would have finished 102nd. After I finished I hung around for the awards ceremony, as I wanted to see how my coach and Dean had done. My coach finished 2nd overall and Dean finished 3rd. Unbeknown to me there was an award for Spirit of the Race. My selfless act had been unanimously voted to win Spirit of the Race. The race director said some very kind words about this act and recommended that everyone read my blog. I was absolutely amazed by this and struggled to hold myself together. I went to collect my trophy and afterwards rang my wife and the tears, which I had just managed to hold in finally escaped. I was overwhelmed. My Dad even said he shed a tear when my name was announced. Now for anyone that knows my Dad they will know how much this meant to me as I have never ever known my Dad cry in the 32 years of my life. This touched me more than anything else. After I got my trophy I felt bad for being annoyed about the lad sprinting away from me. I’ll blame it on the exuberance of youth but still think it lacked some etiquette. 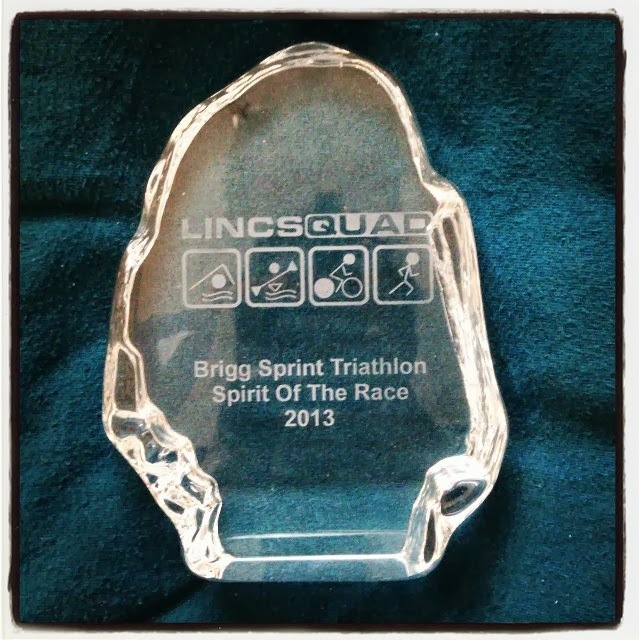 The Brigg Sprint Triathlon is without doubt the best triathlon I have ever competed in. Everything from the route to the marshals was superb. The goodie bag was useful and the best bit is the photos were free and on the Internet that night. 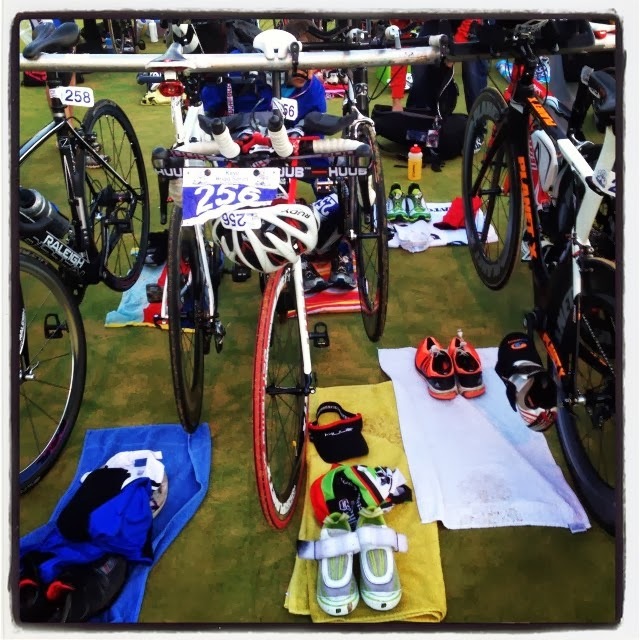 I would recommend this triathlon to everyone. My Dad is even aiming to do it next year. Will I be back? Definitely. I can’t wait. The morale of this tale is that helping others can be nice and be unexpectedly rewarded. It’s kind of like the film Pay it Forward. I just hope my action is remembered by the receiver and he “pays it forward” one day.